Help CentreUsing SuperControl Configuring my propertyWhat is cross-updating? If you have multiple properties you may either let them out individually or wish to group them so they display as one property on your website. For example: Property 1 sleeps 4, next door you also have Property 2 which sleeps 6. Each of these properties can be let individually but you may wish to add an extra licence in SuperControl and call it Property 3. This would be a "virtual" property where it is a combination of properties 1 & 2. 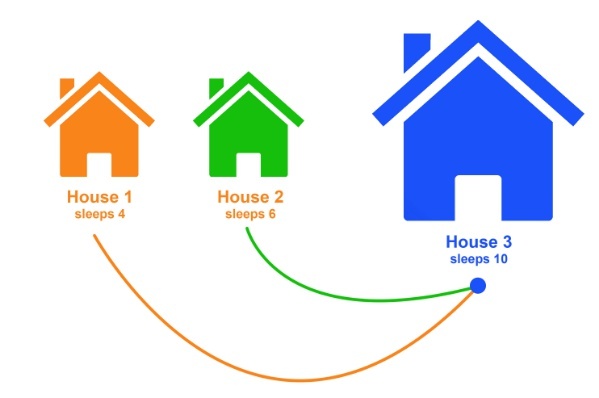 So Property 3, would sleep 10. See below for a diagram. Doing this allows you to display in searches for guests looking for a group booking that sleeps up to 10. It will only benefit you if your properties are within close proximity to one another or is one large property that can be let as individual units. If you decide to add an additional licence to create a virtual property, then please inform our support team (support@supercontrol.co.uk), they will quote you how much it will cost and schedule a time to set it up for you. If a guest books Property 1, it will block availability for Property 3 automatically. If a guest books Property 2, it will block availability for Property 3 automatically. If a guest books Property 3, it will block availability for Property 1 and Property 2 automatically. Can I cross-update my calendar to another SuperControl client that lists my property? It will not schedule owner payments / commission or display on owner statements. Next: Can I link my calendar to another SuperControl client who lists my property?